Radiotherapy plays an important role in the management of lung cancer, with over 50% of patients receiving this treatment modality at some point during their treatment. The Christie NHS Foundation Trust provides the largest radiotherapy service in the country – with around 600 lung cancer patients treated with radical radiotherapy a year – and, together with University College London Hospitals NHS Foundation Trust (UCLH), aims to form a cohesive and collaborative clinical and translational research group. The core principle of the group is to provide individualised radiotherapy treatment that continually pushes treatment boundaries and thus leads to improved outcomes for lung cancer patients. Our research is underpinned by state-of-the-art radiotherapy delivered routinely to our patients including 4DCT and FDG PET-CT planning, intensity modulated radiotherapy, including stereotactic radiotherapy, and online cone beam CT verification. 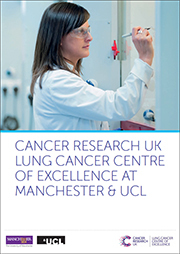 Radiotherapy research in lung cancer is multidisciplinary and benefits from expertise in several disciplines within the field of oncology including clinical oncology, medical oncology, imaging, medical physics, radiobiology, circulating biomarkers, proteomics and immunotherapy. This unique combination of expertise and experience has led to the development of the only biomarker programme in the UK that aims to predict response and toxicity in lung cancer patients treated with radical radiotherapy. The Radiotherapy departments and Clinical Trials Units at The Christie and UCLH have developed strong collaborative links, enabling early phase trials combining thoracic radiotherapy and mechanism based therapies. There is also specific expertise and leadership in the multimodality treatments for stage III non small cell lung cancer (NSCLC) (MEKRT and isotoxic IMRT trials), limited disease small cell lung cancer (SCLC) (CONVERT trial), stereotactic radiotherapy for early stage NSCLC (lungTech trial) and radiotherapy for mesothelioma (PIT trial). In addition, Manchester and London will host the UK’s only two high energy Proton Beam Therapy Centres, with unique opportunities to codevelop joint radiation clinical research for patients, including trials in locally advanced lung cancer and mesothelioma. Our main aim is to position the Centre as an international leader in the field of lung cancer radiotherapy, working collaboratively within the areas of personalised therapy, theragnostics, combined therapies and proton therapy. The delivery of personalised, highly technical radiotherapy, including the evolution of the radiotherapy pathway, should increase accuracy and precision of treatments delivered. This involves interaction and facilitation with multidisciplinary research groups. Theragnostics – predictive models of radiotherapy response and toxicity including biomarkers based on population data – will also enable more individualised treatments. The advancement of early phase trials of combined radiotherapy will include novel agents such as immunotherapy. We will engage and collaborate on phase II/III radiotherapy trials to impact standard of care and explore the role of proton therapy in lung cancer and mesothelioma as an active member of the national Clinical and Translational Radiotherapy Research Working Group (CTRad) Proton Beam Therapy Research Group. Leader of the Radiotherapy in Lung Cancer group in the Institute of Cancer Sciences at The University of Manchester. Professor of Medical Radiation Physics and PhD Graduate Tutor at University College London.